Ryan V. Sears, a fourth grader at Ada Merritt K-8 Center in Miami, is the winner of PAIRS Foundation’s 2010 Father’s Day Essay Contest. In “Light of My Life,” Ryan, 9, writes of his father as “a personal helper who guides you to the right path … He is like a robot with all of the stuff he does for me. He is the nicest robot, but, it’s amazing because he is not a robot.” For many inner city youngsters, growing up with their fathers is increasingly rare. As the children’s essays and Census Bureau statistics reveal, greater numbers of youngsters are being raised without dads at home. In many cases, surrogates, such as grandfathers, uncles and others step in to provide love, support and guidance. 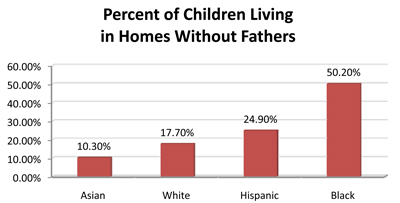 According to the 2009 America’s Families and Living Arrangements Survey, more than half of black children in America are raised in homes without fathers. For Hispanic children, one in four grow up without their fathers at home. It will be many years before we can fully measure the impact on these children, their neighborhoods, and their own future families. Studies have consistently shown youngsters who are raised by single parents have much greater difficulty succeeding in school and are far more likely to experience poverty, homelessness, drug and alcohol abuse, become teen parents, victims of crime, and get arrested. For these young people themselves, the impact often lasts a lifetime. For society, which bears the burden for increased welfare and healthcare expenses, lost productivity and tax revenues, and other state and federal expenditures related to providing a safety net for vulnerable children and families, the ultimate cost is estimated at over $100 billion annually. It’s vitally important to our childrens’ future, and our nation’s, that we strive for a day in which all of our children grow up in an environment in which they’re safe, nurtured, guided, loved, and best able to fulfill their potential. We’ve learned much over the past decade about what couples, families, schools and government can do to help us move closer to that day. Research demonstrates that brief relationship and marriage education programs such as PAIRS Essentials can prevent as many as three in four divorces and the resulting long-term impact of family fragmentation. U.S. Representative Kendrick Meek, who represents Florida’s 17th Congressional District where many of the children who participated in the Father’s Day essay contest live, recently addressed the importance of preventing family breakdown. “What stands out for me about the Healthy Marriage work I have seen in my community are the preventive benefits – such as preventing poverty by helping parents learn to strengthen their families and marriages, reducing conflict, helping children get the parental support they need to succeed and stay in school, and providing a foundation for revitalizing neighborhoods,” Congressman Meek wrote in a letter to the U.S. Department of Health and Human Services and Members of the House Ways and Means Subcommittee for Income Security and Family Support. On this Father’s Day, may we all renew our commitment to each of our sons and daughters and all of America’s children. Seth Eisenberg is President and CEO of PAIRS Foundation, one of the nation’s oldest and leading relationship skills training organizations. The essay contest was an amazing idea and the essays are heart warming. Congratulations, Ryan!